Daniel Gustavo Martucci Universidad de Buenos Aires (Argentina). Natalia Henostroza Quintans Universidad de São Paulo (Brasil) Universidad Peruana Cayetano Heredia (Lima, Perú). diagnóstico así como prevenir la corrosión dental. la Universidad Peruana Cayetano Heredia (Lima, Perú). Dental de la Facultad de Odontología de la Universidad de Buenos Aires (Argentina). Ali DA, Brown RS, Rodríguez LO, Moody EL, Nasr MF. (2002) Dental erosion caused by silent gastroesophageal reflux disease. JAmDent Assoc;133(6):734-7. Amin WM, Al-Omoush SA, Hattab FN. (2001) Oral health status of workers exposed to acid fumes in phosphate and battery industries in Jordan. Int Dent J; 51(3):169-74.
resistance of previously eroded enamel. Caries Res; 34(1):48-52. Bartlett D, Dugmore C. (2008) Pathological or physiological erosion—is there a relationship to age? Clin Oral Investig; 12(Suppl 1):S27-31. Bartlett D, Ganss C, Lussi A. (2008) Basic Erosive Wear Examination (BEWE): a new scoring system for scientific and clinical needs. Clin Oral Investig;12(Suppl 1):S65-8. Berg-Beckhoff G, Kutschmann M, Bardehle D. (2008) Methodological considerations concerning the development of oral dental erosion indexes: literature survey, validity and reliability. Clin Oral Invest; 12(Suppl 1):S51–S58. Burkhart N, Roberts M, Alexander M, Dodds A. (2005) Communicating effectively with patients suspected of having bulimia nervosa. J Am Dent Assoc;136;1130-7. Chunmuang S, Jitpukdeebodintra S, Chuenarrom C, Benjakul P. (2007) Effect of xylitol and fluoride on enamel erosion in vitro. J Oral Sci; 49(4):293-7. Eccles JD. (1979) Dental erosion of nonindustrial origin. A clinical survey and classification. J Prosthet Dent; 42: 649–53. Faine MP. (2003) Recognition and management of eating disorders in the dental office. Dent Clin North Am; 47(2): 395-410. Gandara B, Truelove E. (1999) Diagnosis and Management of Dental Erosion. J Contemp Dent Pract ; 1(1): 16-23. Ganss C. (2008) How valid are current diagnostic criteria for dental erosion? Clin Oral Invest; 12 (Suppl 1):S41–S49. Garone Filho W, Silva VA. (2010) Lesiones no cariosas. São Paulo: Ed. Santos. Grippo JO, Simring M, Schreiner S. (2004) Attrition, abrasion, corrosion and abfraction revisited. A new perspective on tooth surface lesions. J Am Dent Assoc; 135(8): 1109-18. Howden GF. (1971) Erosion as the representing symptom in hiatus hernia: a case report. Br Dent J;131(10):455-6. Orange JuicesT J Dent Res;85(3):226-30. Kim H, Douglass C. (2003) Associations Between Occupational HealthBehaviors and Occupational Dental Erosion. J Public Health Dentist; 63(4): 244-9. Litonjua LA, Andreana S, Bush PJ, Cohen RE. (2003) Tooth wear: attrition, erosion and abrasion.Quintessence Int; 34(6):435-46. Little JW. (2002) Eating disorders: dental implications. Oral Surg Oral Med Oral Pathol Oral Radiol Endod; 93(2):138-43. Lussi A, Jaeggi T. (2008) Erosion - diagnosis and risk factors. Clin Oral Investig;12 (Suppl 1):S5-13. Lussi A. (1996) Dental erosion: clinical diagnosis and case history taking. Eur J Oral Sci;104(2 Pt 2): 191-8. Magalhães A, Rios D, Rodrigues C, A, Botazzo A, Rabelo M, Aparecida de Andrade M. (2008) The influence of residual salivary fluoride from dentifrice on enamel erosion: an in situ study. Braz Oral Res; 22(1): 67-71. Mandel L. (2005) Dental erosion due to wine consumption. J Am Dent Assoc;136: 71-5. Mas López AC. (2002) Efecto erosivo valorado a través de la microdureza superficial del esmalte dentario, producido por tres bebidas industrializadas de alto consumo en la ciudad de Lima. Estudio in vitro. Lima: Universidad Nacional Mayor de San Marcos. Meurman JH, Vesterinen M. (2000) Wine, alcohol and oral health, with special emphasis on dental erosion. Quintessence Int ; 31(10):729-33. Nixon PJ, Youngson CC, Beese A. (2002) Tooth surface loss: does recreational drug use contribute? Clin Oral Investig; 6(2):128-30. Nogueira FN, Souza DN, Nicolau J. (2000) In vitro approach to evaluate potential harmful effects of beer on teeth. J Dent; 28(4):271-6. Rees J, Hughes J, Innes C. (2002) An in vitro assessment of the erosive potential of some white wines. Eur J Prosthodont Restor Dent; 10(1):37-42. Smith BG, Knight JK. (1984) An index for measuring the wear of teeth. Br Dent J; 156:435–438. Ten Cate J, Imfeld T. (1996) Dental erosion, summary. Eur J Oral Sci; 104: 241-244. West NX, Hughes JA, Addy M. (2001) The effect of pH on the erosion of dentine and enamel by dietary acids in vitro. J Oral Rehabil; 28(9):860-4. Woodmansey KF. (2000) Recognition of bulimia nervosa in dental patients: implications for dental care providers. Gen Dent; 48(1):48-52.
indices-flawed or valid? Clin Oral Investig;12 (Suppl 1):S59-63. SUELDO PARRAGUIRRE, Gisela Paola et al. Erosión o corrosión dental: factores etiológicos y diagnóstico. Actas Odontológicas (Publicación discontinuada), [S.l. ], v. 7, n. 2, p. 5-11, apr. 2016. ISSN 2393-6304. 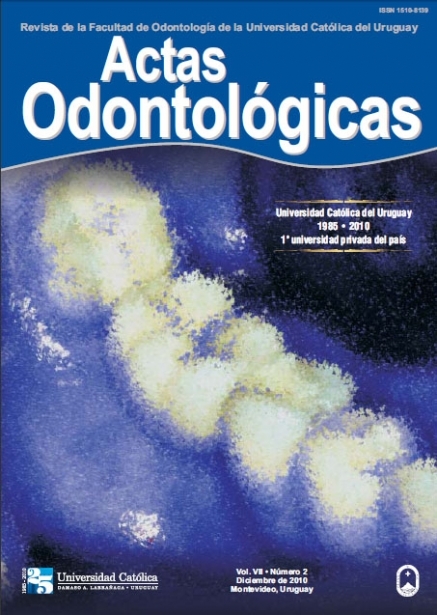 Disponible en: <http://revistas.ucu.edu.uy/index.php/actasodontologicas/article/view/1056>. Fecha de acceso: 19 apr. 2019 doi: https://doi.org/10.22235/ao.v7i2.1056.